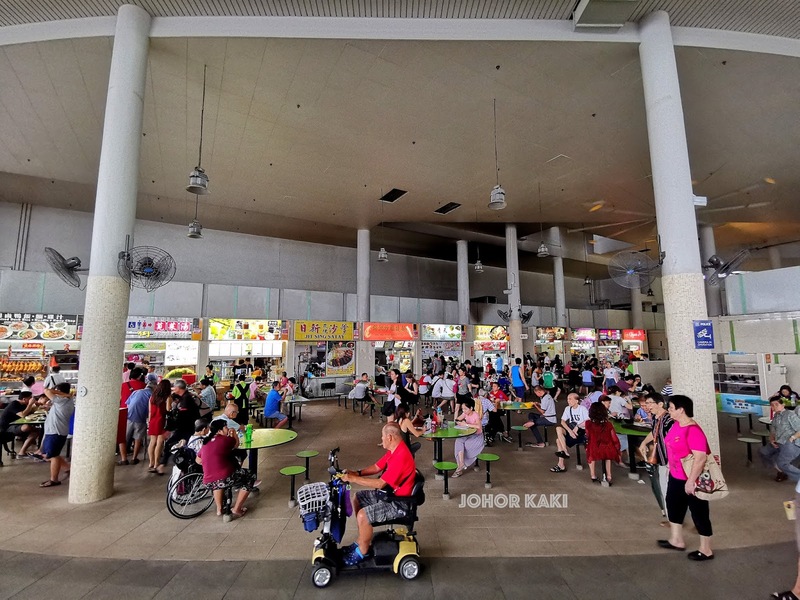 Bedok Interchange Hawker Centre (BIHC) is one of the largest in Singapore - it has 70 hawker stalls and 1,000 seats. 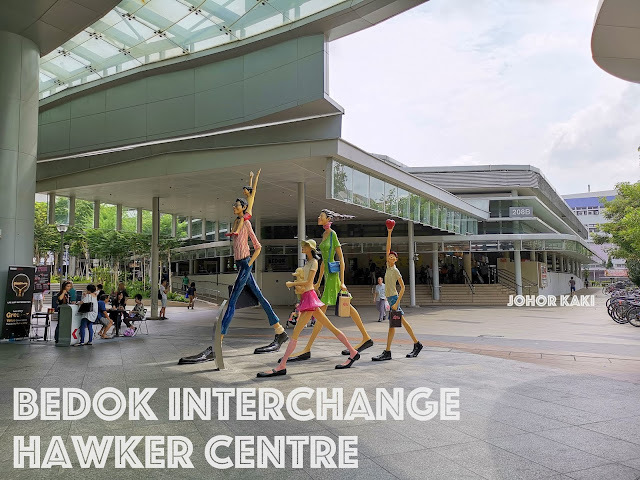 BIHC opened in 2014 under the Remaking Our Homeland programme, replacing the smaller old hawker centre built in 1979. BIHC is at the heart of Bedok, the largest public housing estate in Singapore with a population of around 300,000. Bedok was named after Sungai Bedok or Bedok River. 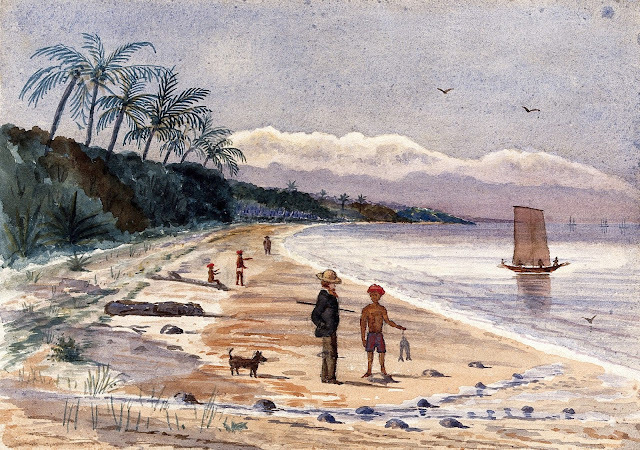 The first written record of the river was over 400 years ago in a map of Singapore prepared in 1604 by Malay-Portuguese cartographer Manuel Godinho de Erédia. 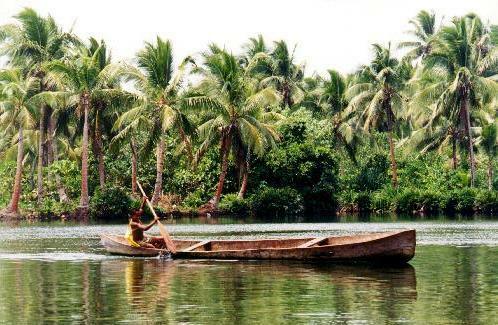 The river was known then as Sunebodo. 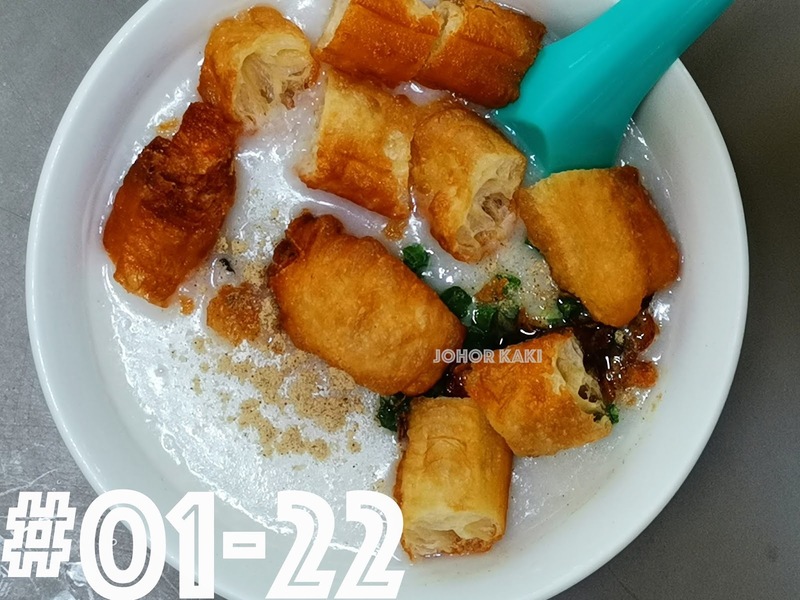 Where is Sungai Bedok today? It is Bedok canal. The old hawker centre and the new have the same number of hawker stalls (70), and most of the stalls today are from the old centre. But, the new modern sprawling hawker centre is clean, bright and well kept - a big improvement over its predecessor. 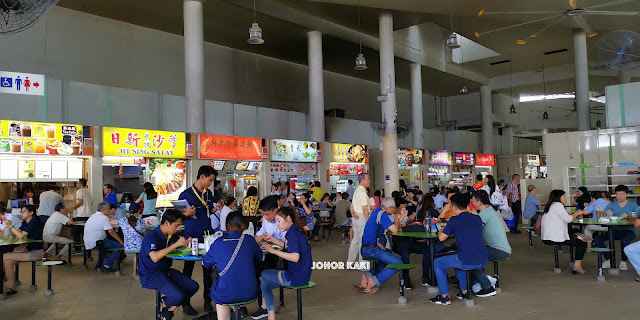 A combination of well spaced seating, high ceilings, wide open sides, giant ceiling fans, supplemented by wall fans kept the food centre cool and comfortable. 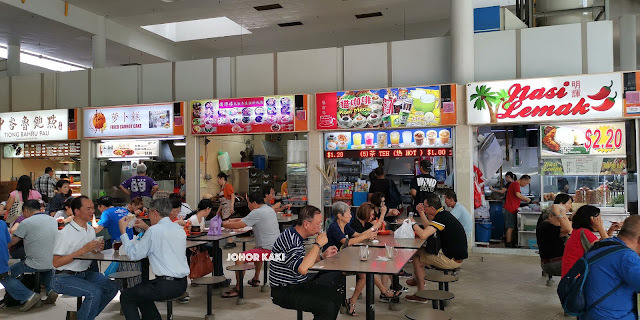 Food prices at Bedok Interchange Hawker Centre remained affordable, for example, there are still $1 fried bee hoon, $2.20 nasi lemak set and $3 chicken rice set. 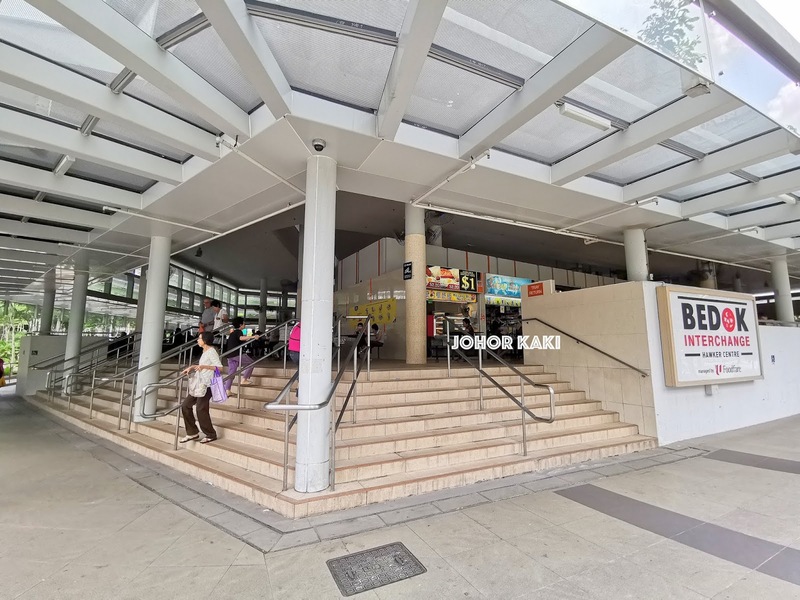 Customers are of all age groups from Bedok residents to workers and students from offices and schools nearby. 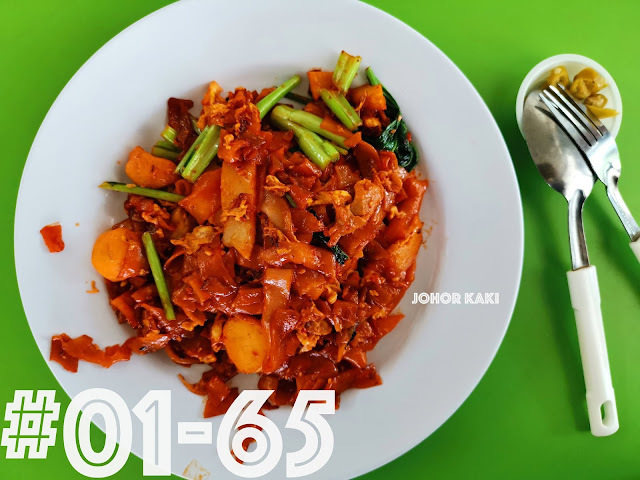 On weekends and public holidays, former neighbours who have moved from Bedok Centre to other parts of Singapore come back to meet old friends and eat at the old hawker stalls for the good old flavours and renew their friendships. I realised that many hawkers also live in Bedok themselves. So it's folks from the community serving the community they live in. 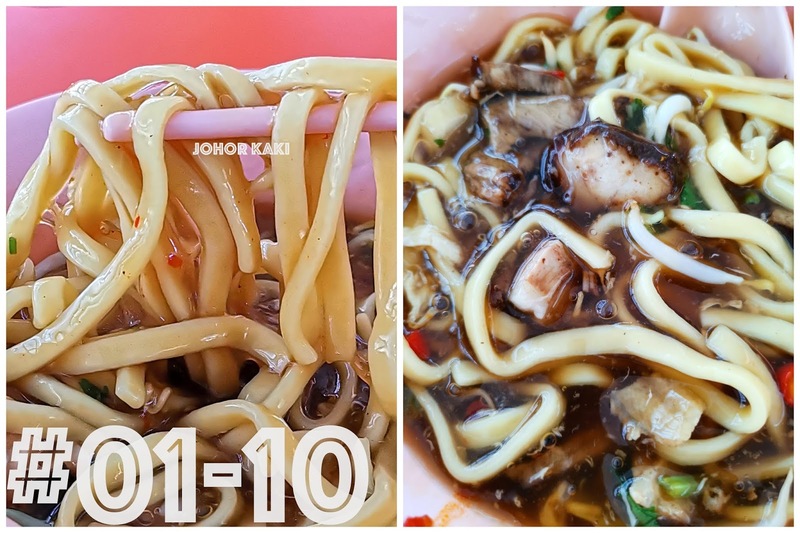 It's such bonds that make some Singapore hawker centres special that goes beyond tasty or not. That's why when we ask regulars why they keep coming back to their favourite stalls, they only say "I'm used to it". And, that is enough. No need for famous or highly awarded stalls. While exploring Bedok Interchange Hawker Centre for good food, I noticed that every single stall at BIHC was graded A for hygiene by Singapore's National Environment Agency (NEA). Kudos to the hawkers for their dedication and commitment towards food safety. There's a common joke that NEA grade A for hygiene actually means Average tasting food. I spent a few weeks at BIHC to find out how much truth is there behind the quip. 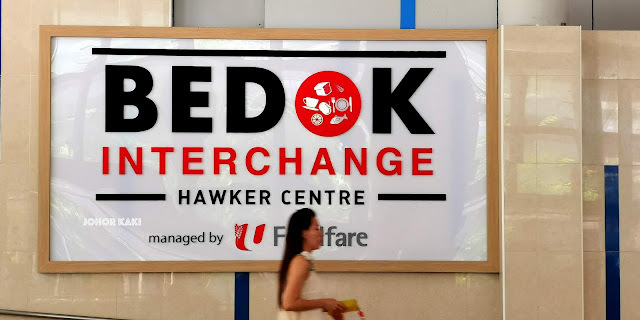 Though the name Bedok has been in use for over 400 years, no one is sure where it came from. Some believe it came from "bedoh or beduk", the large traditional Malay drum used to sound the Islamic call to prayer before there were loudspeakers. The name Bedok could also come from the word "biduk", a small wooden riverine craft that used to ply Sungai Bedok - yes, there was a Bedok River but today it is Bedok Canal which runs south from Bedok Reservoir, past Simpang Bedok, through Laguna golf club before draining into the Singapore Straits. Mei Xiang Prawn Mee.Lor Mee looked like the most popular stall in the hawker centre. It had longest queue every time I was here. The starch thickened gooey dark sauce was savoury with slight underlying sweetness and spiciness (because I folded chili sauce into the noodles). They were quite generous with the tender savoury sweet stewed pork belly, even for the small $3 serving I bought. Many people add scoopfuls of mashed garlic for more garlicky, spicy kick. Mei Xiang's prawn mee is the Singapore old school type. It had layered crustacean and porky savoury sweetness in the soup. I like this soup. The stall is generous with ingredients even for the $3 serving which comes with fish cake slices, shelled prawn, pork slices and bean sprouts on top of the yellow noodles. 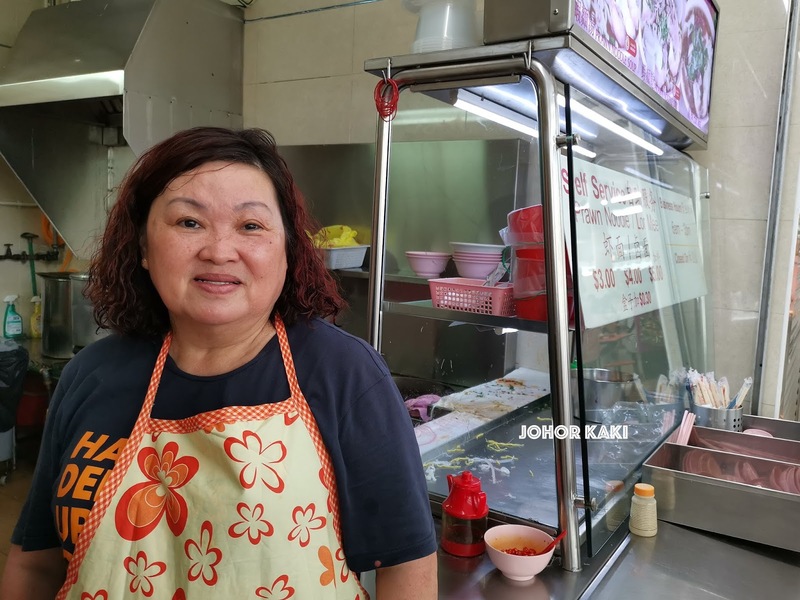 Ms Tan's mum was running a bao (steam meat bun) stall in Tanjong Rhu when the family was among the first to move to live in Bedok Centre in the 1970s. 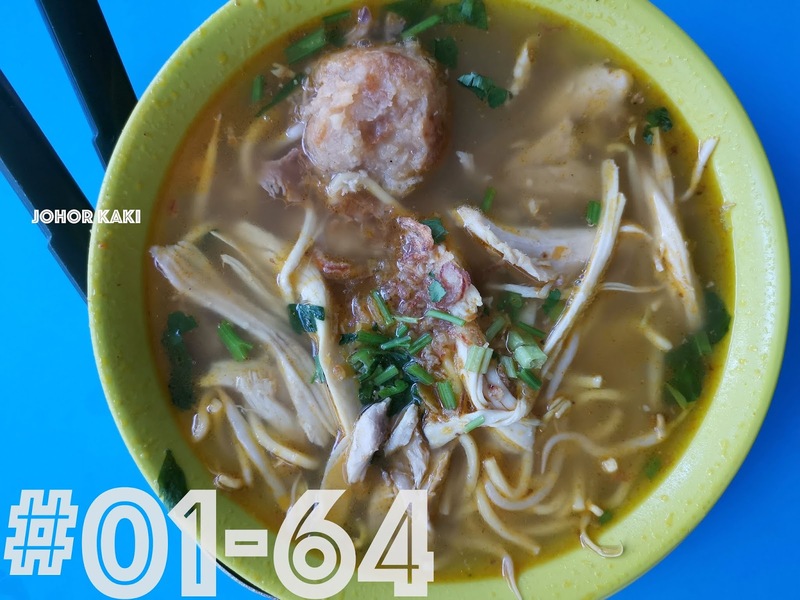 When the old Bedok Central hawker centre opened in 1979, they secured a stall and switched to selling prawn mee and lor mee. Ms Tan runs the stall now with her younger brother and sister-in-law. A stalwart of Bedok Centre, Mei Xiang is still one of the best loved stalls at Bedok Interchange Hawker Centre. Bedok Prawn Noodle. 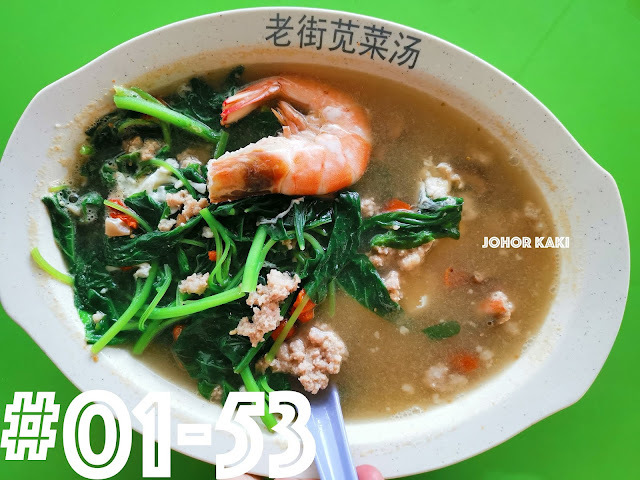 Another old school prawn noodle stall which is generous with their ingredients which included good size shelled prawns even for the $3 serving. I like their soup which has a robust crustacean (prawny) savoury flavour balanced with sweetness. I had the dry version - their savoury spicy lardy sauce would be perfect for me if it had a bit more layers and slightly stronger kick. 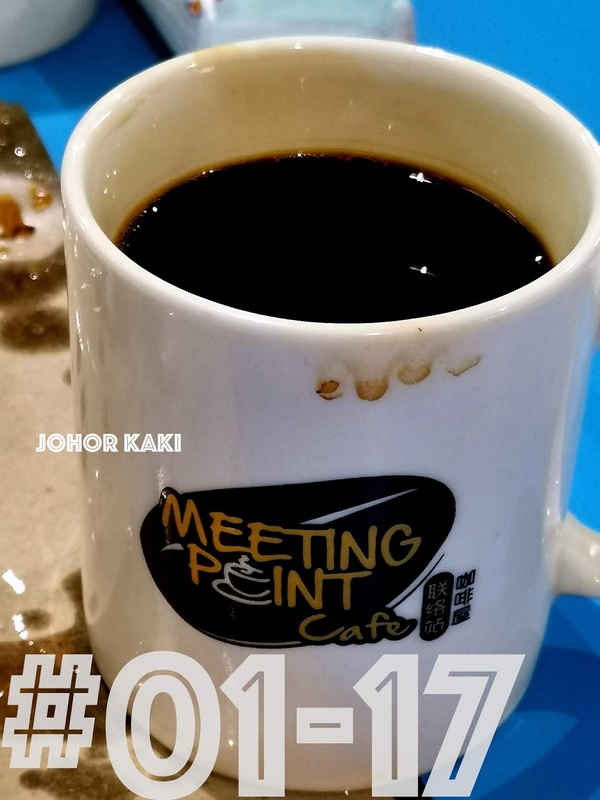 Meeting Point Cafe - when at Bedok Interchange Hawker Centre, I get my usual kopi O siew tai fix here. The brew is robust with Robusta aroma and bitterness balanced with just a bit of sugar sweetness (for siew tai). I didn't try their kopi or kopi C, but judging from the robustness of their kopi O, I expect them to be tasty and smooth. Fatt Soon Kueh - The translucent skin was thin but had a nice tender squeaky chewiness. 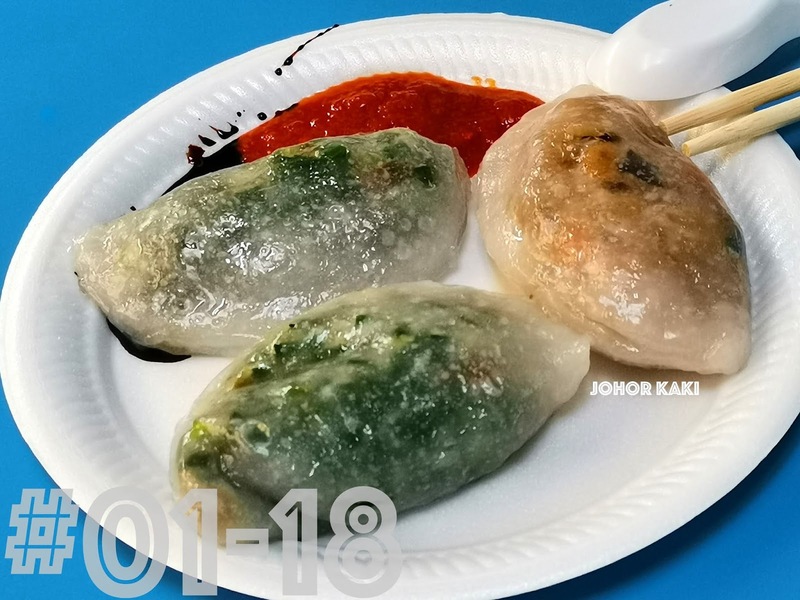 Freshly hand crafted at the stall, the pockets were well filled with chives and stewed jicama (mung kuang) which were quite robustly savoury, complementing the natural sweetness of chives and mung kuang. Dried shrimps gave the dumplings the needed savoury balance. Siglap is part of Bedok. 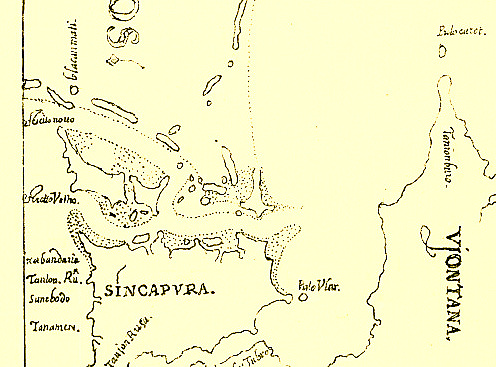 The name Siglap came from the Malay phrase "si-gelap" meaning "darkness that conceals". 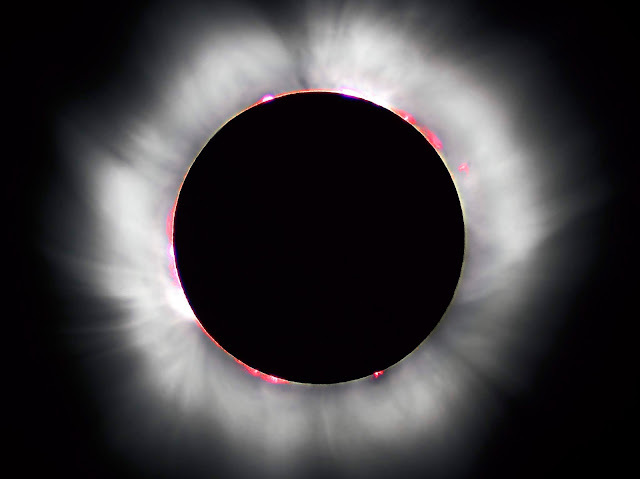 A total eclipse of the sun occurred on 4 Mar 1821, the year Tok Lasam founded the village here. Tok Lasam was one of the Minangkabau princes who came to Singapore from Sumatra. Tok Lasam's grave is at Jalan Sempadan (off Upper East Coast Road) near Villa Marina condominium. Tanah Merah means "red cliffs" in Malay. There used to be seafront red cliffs that afforded commanding views of the Singapore Straits and which sailors used to guide their ships sailing south of Singapore. The red cliffs were among the first high grounds to go under land reclamation which began in earnest in 1962. All that remains today is the name Tanah Merah. 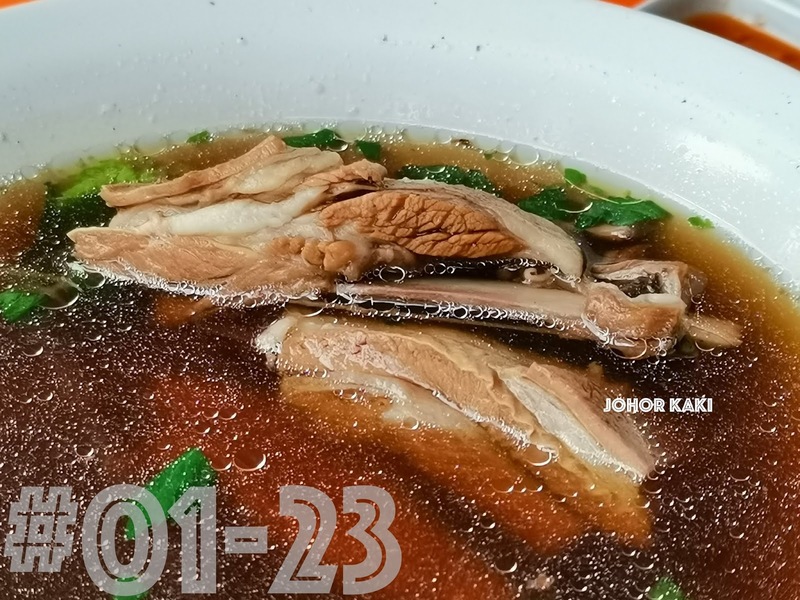 New World Mutton Soup. The soup was watery with mild "kum kum" liquorice herbal taste and sweet savoury flavour. The mutton was juicy and fall-off-the-bone tender with a nice squeaky chew (not mushy). The meat was sweetish with subtle underlying mutton gaminess. Good for folks who are put off by full blown mutton gaminess. 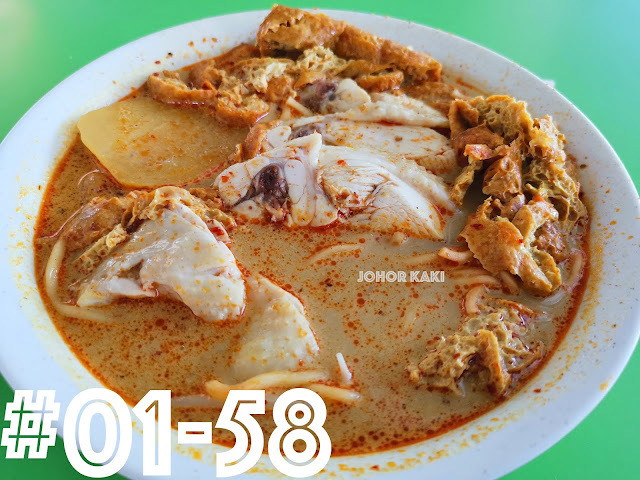 For centuries, the main occupation of villagers of Kampong Siglap and Kampong Bedok was fishing. The trade declined when reclamation works started here in 1962. By the 1970s, only 100 fishermen were left before they were all gone. 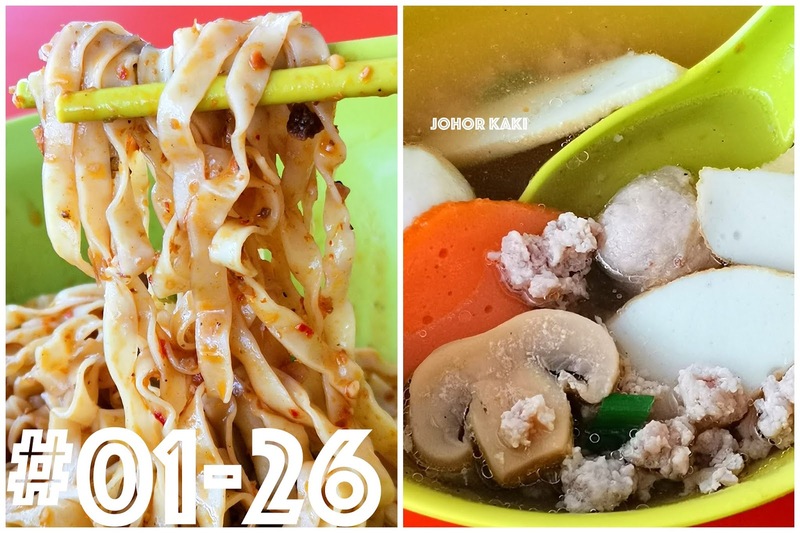 Teo's Noodle (known as Choon Huat at the old Bedok Centre hawker centre). One of the most popular stalls at BIHC. The noodles were done soft al dente with a subtle crunchy spring. 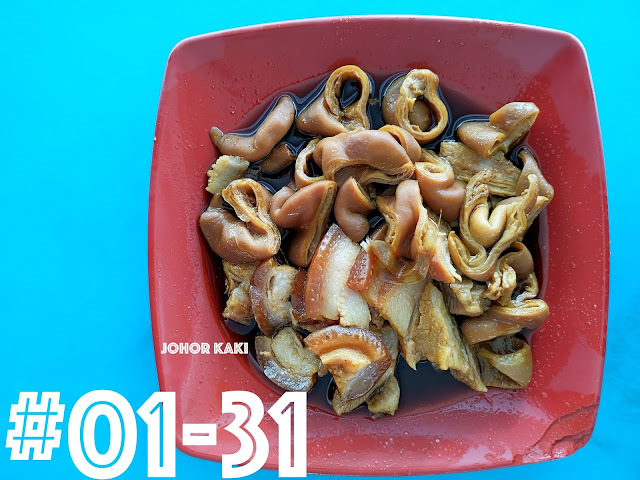 The sauce was quite robustly savoury spicy, leaning on the slightly salty side with chopped chai poh and fried garlic bits. 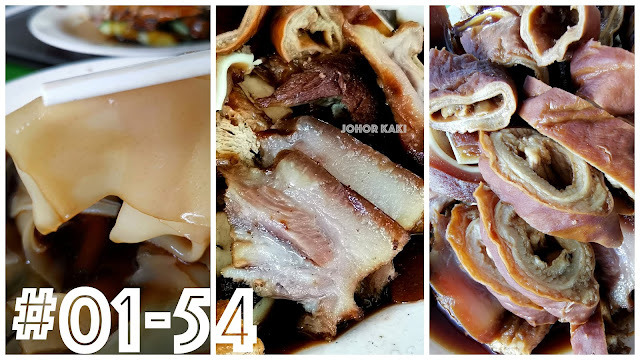 Lard and lard cracklings gave the bak chor mee a nice old school taste. The soup was sweetish savoury but lacked pork bone taste. The minced pork inside was nice with tender squeaky chewy bite. Frankel Estate was founded by the Jewish Frankel family who migrated penniless from Lithuania to Borneo, then to Kuala Lumpur before coming to Singapore in 1878. The enterprising family prospered as owners of 400 acres of rubber and coconut plantations in Siglap. The Frankels left for the USA with the onset of World War II. 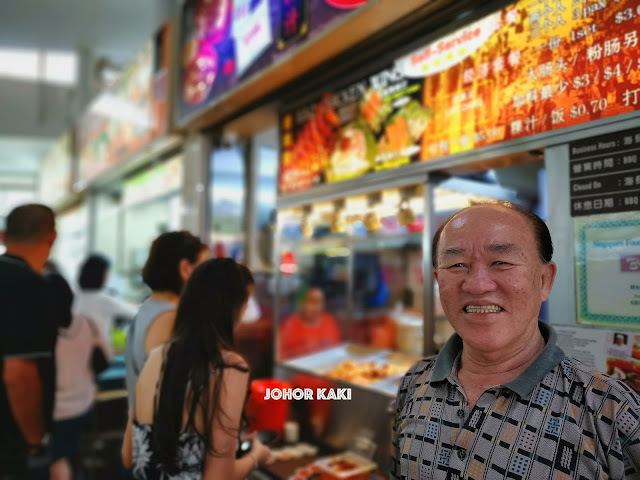 Mr Lim's father founded Hai Fai kway chap in 1964 in Tanjong Rhu (that makes this stall older than Singapore). Mr Lim moved the stall into the old Bedok Centre hawker centre in 1979 and then into BIHC when it opened in 2014 as the family still lives in Chai Chee. His daughter Christina now 55, runs the stall with sprightly Mr Lim (age 82) and wife (age 79) helping out. 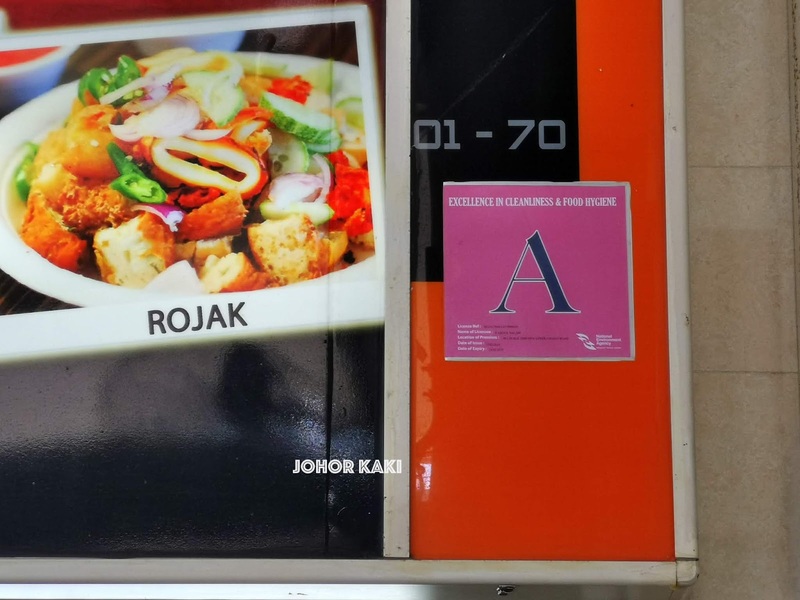 Rosa Frankel spoke only Yiddish but not Malay or any of the local languages. When resourceful Rosa went to the market, she would bring along an egg and a chicken feather. 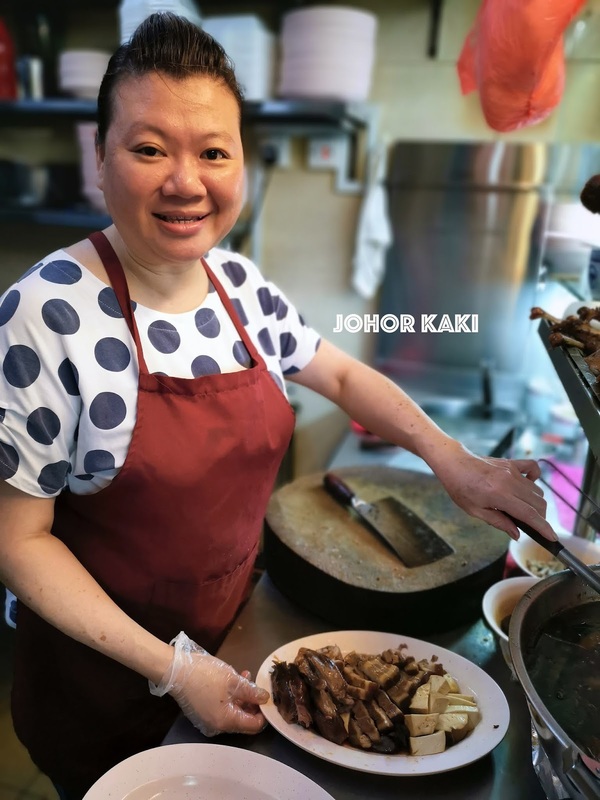 That was how she was able to tell the hawker that she wanted to buy eggs or live chicken. Ming Hui Nasi Lemak. 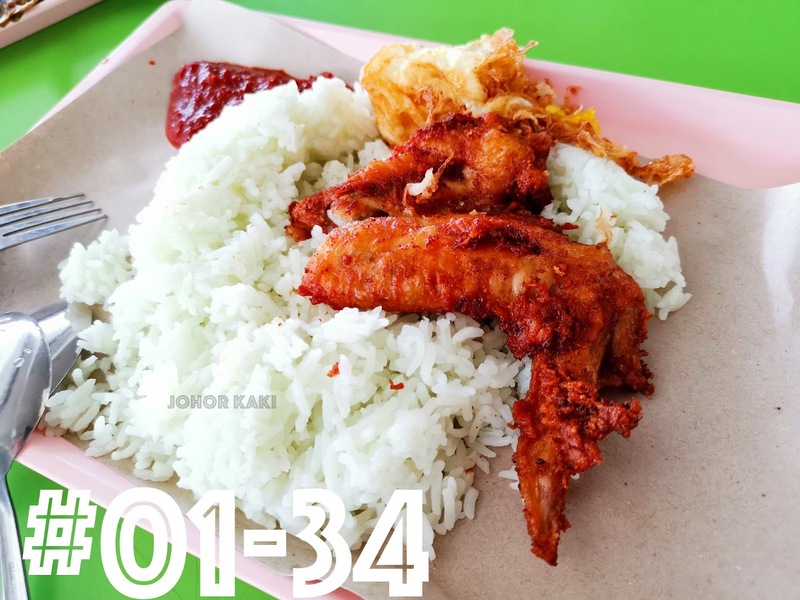 A generous nasi lemak set with coconut flavour rice, sambal chili, fried chicken wing and fried egg, all for $2.20. The sweetish rice though clumpy had a mild coconut milk flavour and was not greasy. The sambal chili was savoury salty spicy. The savoury/ salty chicken wing had a slight crisp outside while tender and moist inside. 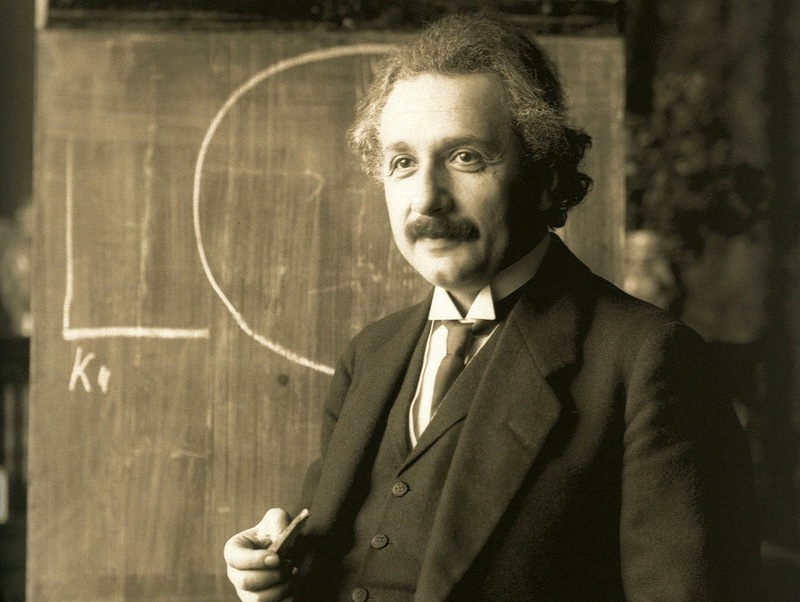 What has Albert Einstein got to do with Bedok? He stayed with the Frankel Family in Nov 1922 on his way to present lectures in Tokyo. In Singapore, he helped raised funds for the Hebrew University in Jerusalem. Einstein mentioned in his dairy how much he loved the coconut palms of Frankel Estate. Song Zhou Fried Carrot Cake 松洲箩卜糕. There are black and white versions - I opted for black which is the stall's signature. 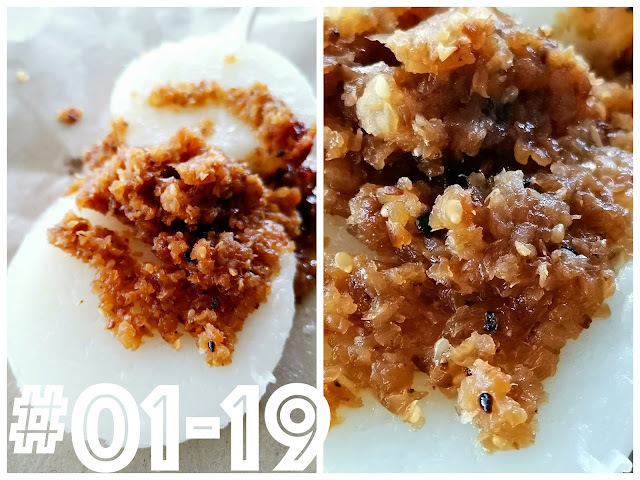 The kueh were soft and well enveloped with a blend of sweet, savoury, eggy and toasty flavours. There were savoury bits of chai poh and garlic which balanced the black sauce's sweetness. Even the minimum $3 order got me a generous serving of tasty carbs. 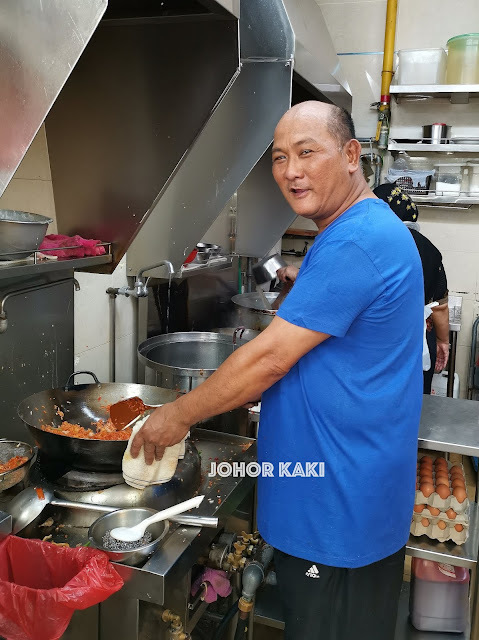 Tan Kim Leng who has been frying chai tow kueh for nearly 40 years, learnt the ropes from his father-in-law. 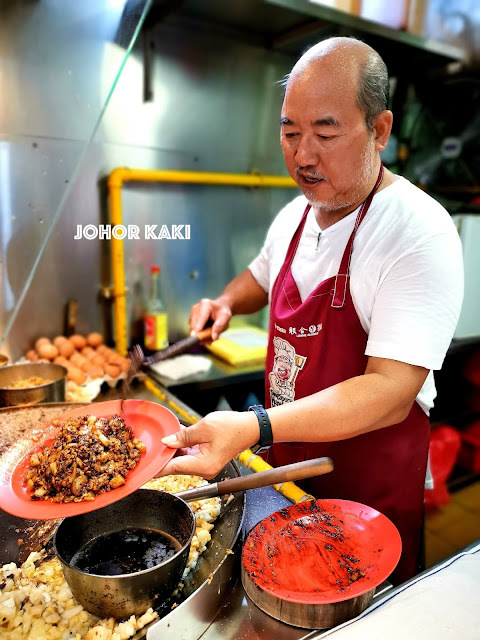 He clinched the Singapore Hawker Master award in 2012. The stall opens from morning till night, so there are shifts of staff. When you see Mr. Tan personally at the wok, you have struck lottery - so cash in your good luck! 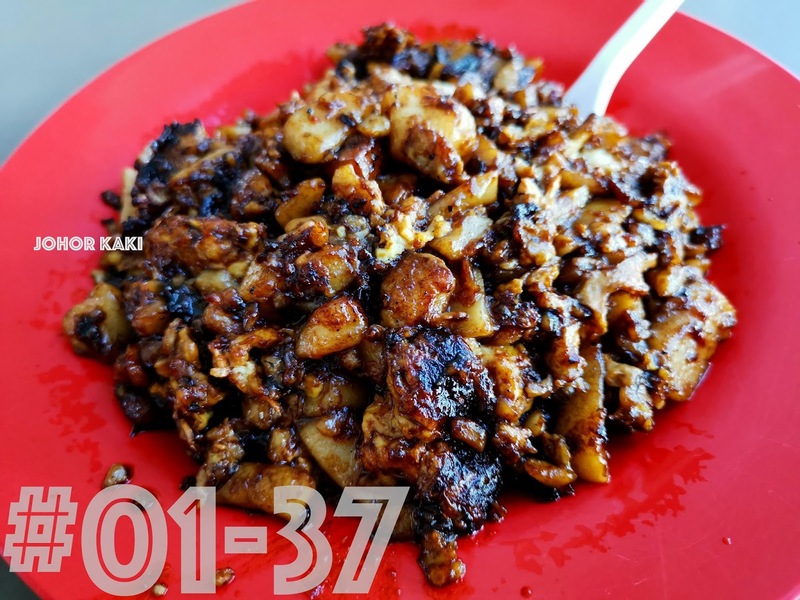 Jimmy People's Park Fried Kway Teow. 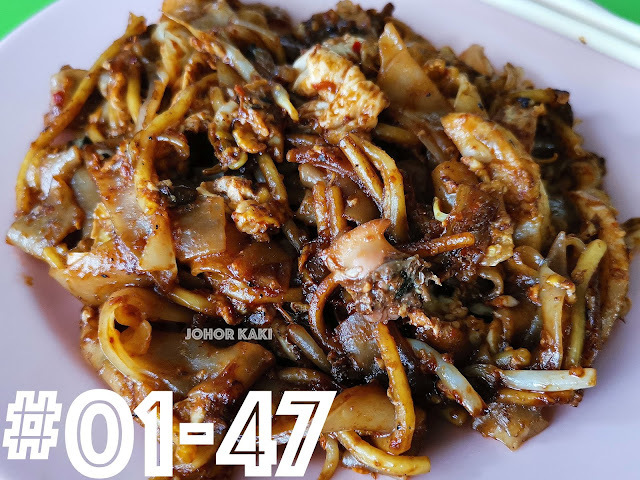 The char kway teow is quite well loaded with fish cake slices, blood cockles, lup cheong (Cantonese wax sausage), bean sprouts, egg and noodles but no chives. Mildly savoury sweet but no toasty wok hei flavour. Public domain photo: Wikipedia. There are no photos of Sook Ching. This is a photo of captured Sikh soldiers executed in Changi. Sook Ching victims were executed in the same way. 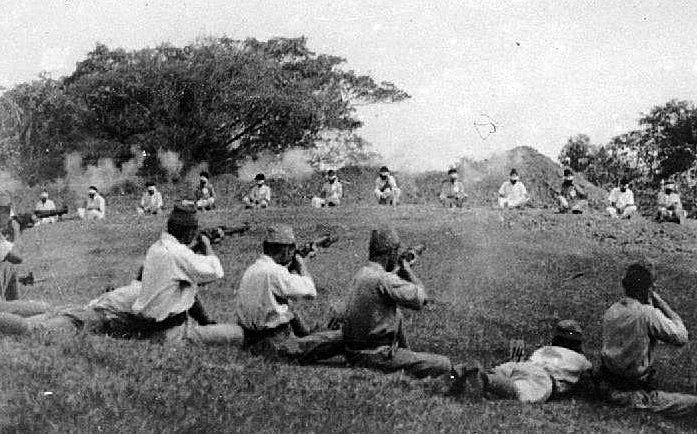 During the Japanese Occupation (1942 - 1945), Siglap Hill was one of the execution grounds of captured civilians under Operation Sook Ching (purge of Chinese perceived to be a potential threat to Japanese rule). Over 40 mass graves were found here in the 1960s. Over 50,000 civilians perished under Sook Ching. The graves were exhumed and remains interred at the Civilian War Memorial in 1967. 正宗川味 is the only Ma La Xiang Guo stall at this hawker centre. It has a good range of ingredients and I like it that they are fresh. Ordering is simple - just point and the staff will pick out the right serving portion for you from the chiller. Choose your level of spiciness - small, medium and big. Wait while they cook your order and collect your food when your number is called. We ordered medium level spiciness which turned out quite mild for my taste buds. Good quality ingredients, reasonable pricing (our 2 person serving cost $12.50), but I felt the sauce lacked sufficient robustness (kick) and layers of flavours. Siglap was once the "Hollywood of Singapore". The Cathay-Keris Studio founded in 1953 made around 125 Malay movies before it closed in 1973. 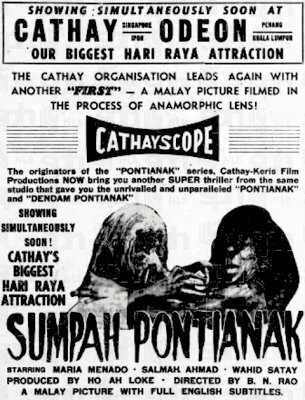 Among them was the 1957 cult horror classic Pontianak about a lady who died during childbirth. The vengeful ghost went stealing babies from pregnant women 😱 Pontianak was translated to Cantonese and English, and two sequels were made. It also spawned the Pontianak genre of horror movies. As a child, I lost some sleep after watching these. 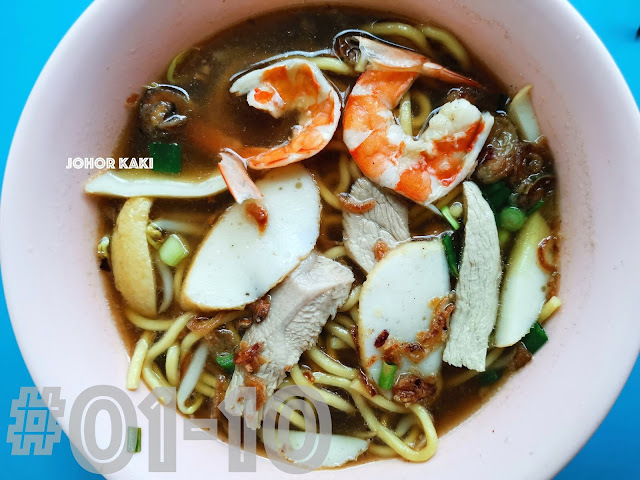 Gim Chew Fried Hokkien Mee founded in 1979 is one of the stalwarts of old Bedok Centre. 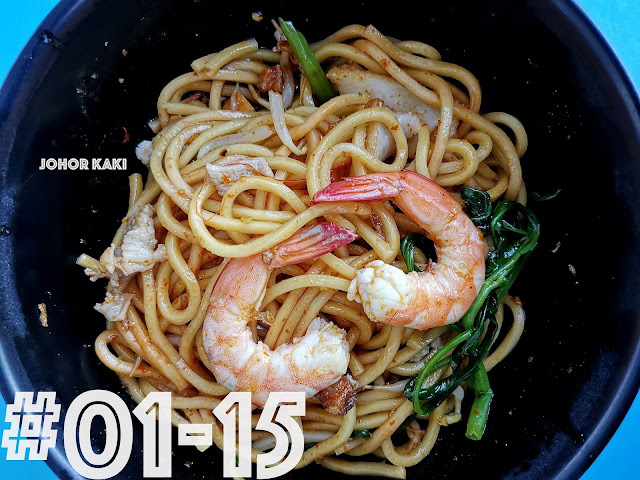 The tender noodles were soaking in a mild crustacean savoury sweet sauce and topped with squid and prawns. Clean tasting but missing the savoury sweet layers from pork and lard, and also lacks wok hei. Sambal chili was very salty. Kampong Chai Chee grew from a farmers' market that sprouted organically in the 1920s. Its name came from the Hokkien phrase 菜市 which means "vegetable market". 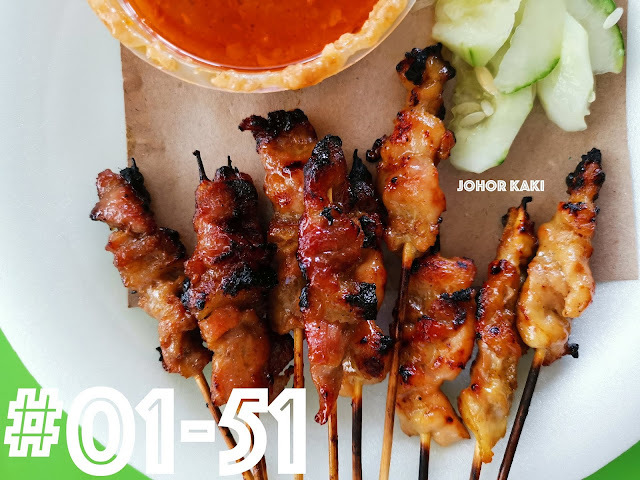 Jit Sing serves charcoal grilled chicken and pork satay. The grilled satay were well browned with bits of char at the edges. There was a slight aroma of caramelised marinate from the grilled meat. The tender meat didn't have much flavour, the marinate was just slightly savoury sweet spicy. The peanut sauce was covered in red chili oil but it tasted just mildly sweet spicy nutty. 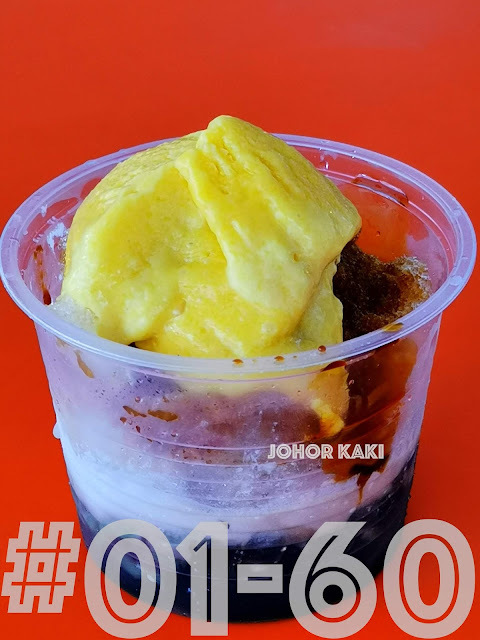 During the colonial era, Simpang Bedok was the recreation hub with many food stalls serving British soldiers based in and around Changi. Today, it is still a thriving foodie hub with a mix of traditional and trendy hipster cuisine. Old Street Spinach Soup. A well liked stall judging by the queue. We tried their signature spinach soup which was good value for money at $3.80 a serving. There were minced pork, bits of mushroom, wolfberries (goji), two prawns and a large clump of leafy spinach in the medium body soup. The soup tasted sweetish savoury. There was a sand mine in 1950s Bedok, in an area known as Koh Sek Lim. By 1961, the sand mine was 9 metres deep and covered an area of 8 acres. Today, it is the beautiful Bedok Reservoir. Shun Xing Braised Duck. Rice. Noodle. Kway Chap. The stall serves the full range of uncle pleasing braised pork intestines, snout, ears, etc. All were tender and juicy with mild savoury/ salty flavour and subtle underlying herbal taste. The kway (rice sheet) served in a dark watery soup which was herbal savoury, was soft and very smooth. I also had the braised duck which was tender and juicy, and served smothered in a gooey dark savoury sauce. The savoury dark sauce dominated the flavours but was slightly flat tasting. Ms Lim the owner of Shun Xing Braised Duck is one spunky lady. She started her own braised duck and pork stall in Havelock Road hawker centre without any experience when she was a teenager. Just learnt the ropes on the fly, she said. That was nearly 40 years ago. When Bedok Interchange Hawker Centre opened in 2014, Ms Lim took the opportunity to move here as her family lived near Bedok Reservoir for decades. Havelock's loss is Bedok's gain. Ms Lim's loyal fans from Havelock still visit her at Bedok. 99 Dessert In Cup. 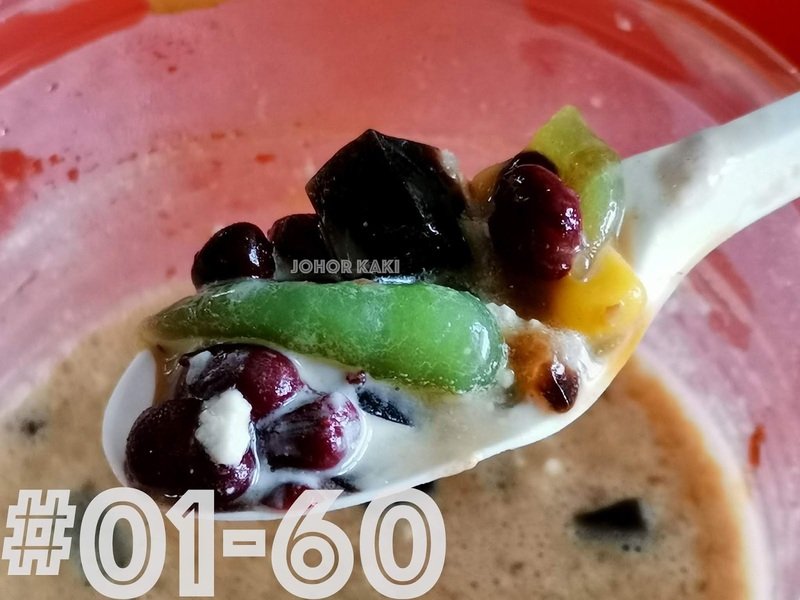 Chendol purists would throw their hands up in protest - this chendol is a wild version of the simple dessert but I like it leh.... 😋 In addition to the traditional shaved ice, red beans, pandan green "worms", gula Melaka and coconut milk, 99 Dessert In Cup's version has corn, attap seed, and grass jelly cubes. The layers of sweetness worked well together. Presentation wise, 99 Dessert In Cup's chendol isn't very pretty - all the goodies were buried invisible under the shaved ice in a deep disposable plastic tub. But it tastes nice lah, and that is all that matters right.... ? 😆 Real pandan "worms" made with pandan leaves and rice flour - not many places in Singapore have this. 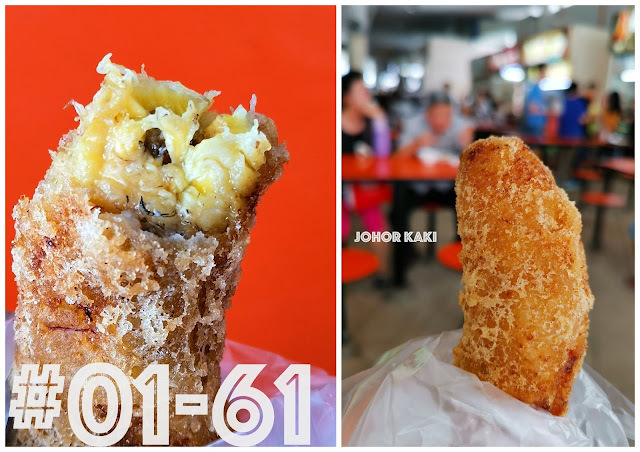 They also have a version with durian (for 50 cents more). Lee Kee. The batter was thin and crisp, encasing a melty soft tangy sweet custard-like whole banana inside. Best eaten piping hot straight off the wok, so look out and wait for it. 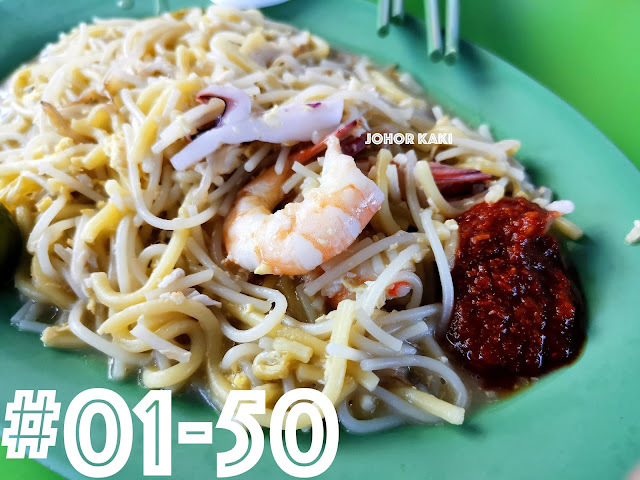 Inspirasi is famous for their mee rebus and mee soto. The mee soto soup was watery with mild savoury sweet spicy flavour. The pulled chicken shreds were tender but had little flavour. The bergedil (mashed potato cutlet) was savoury sweet - it is Inspirasi's top draw. But, they don't serve the black sambal pedas which Indonesians do. 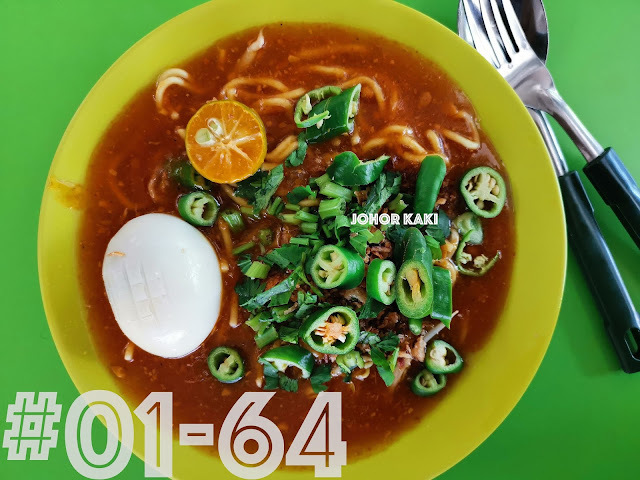 Inspirasi's mee rebus is also very popular. 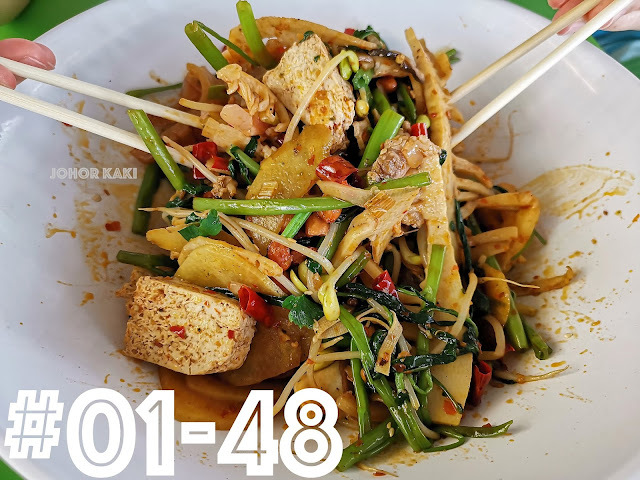 It's simply boiled yellow noodles smothered with mildly savoury spicy sweet gooey sauce. All the flavours were in small doses - somehow I was able to finish the plate of noodles even though it was my second plate of noodles in quick succession. They don't serve savoury spicy sambal chili but the cut green chili peppers worked well to provide the spicy kick. Jefri The Original Botak Chicken Rice. I love their rice - good quality grains, cooked to tenderly firm nutty texture. Well infused with savoury chicken stock taste which complemented the rice's sweetness well. The deep fried chicken was crisp outside, tender inside. Chicken tasted mainly mildly savoury which worked well with the savoury sweet rice. The watery chili was good - sweetish mildly spicy in layers. When l finished all the chicken (there wasn't much), l cleaned the plate of rice to the last grain with the chili. Add 50 cents more for chicken with fried rice. I tried the fried rice which had a slight spicy taste added. 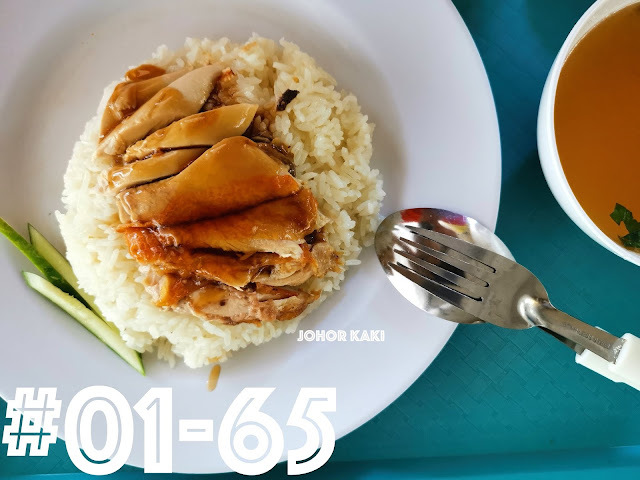 Still prefer the original chicken rice. 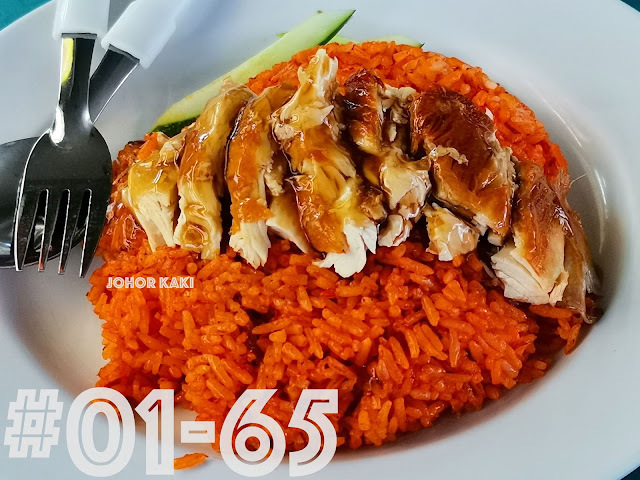 Jefri serves a variety of noodles and rice dishes besides their signature fried chicken rice. The fried kway teow had bits of chicken, a forefinger size prawn, fish cake slices, fish ball (halved), egg and chai sim greens. The fried kway teow tasted mildly savoury spicy sweet and was not overly greasy. 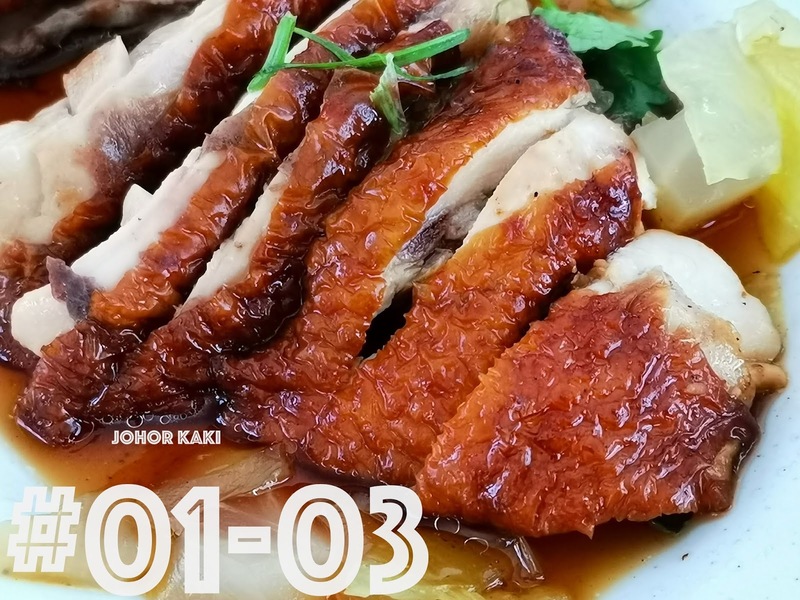 Meet Jefri, the original botak of The Original Botak Chicken Rice. 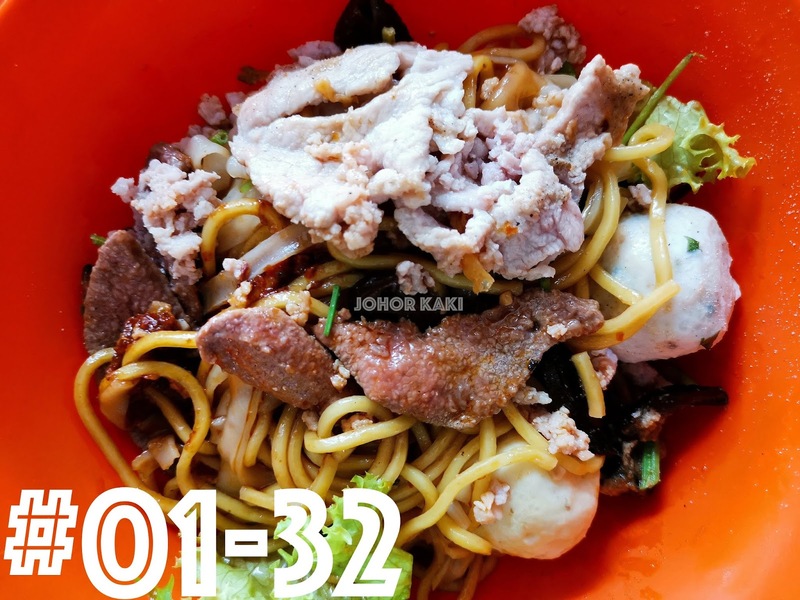 Jefri was one of the hawkers who moved to the new hawker centre from the old Bedok Centre hawker centre. 👉 Seventy stalls, plenty of food choices at reasonable prices here at Bedok Interchange Hawker Centre with a few hawker gems worth making a special trip for. Which are your favourite stalls at Bedok Interchange Hawker Centre? Please share with us in the comments. I never lived nor grew up in Bedok. But, I have fond memories of Siglap. 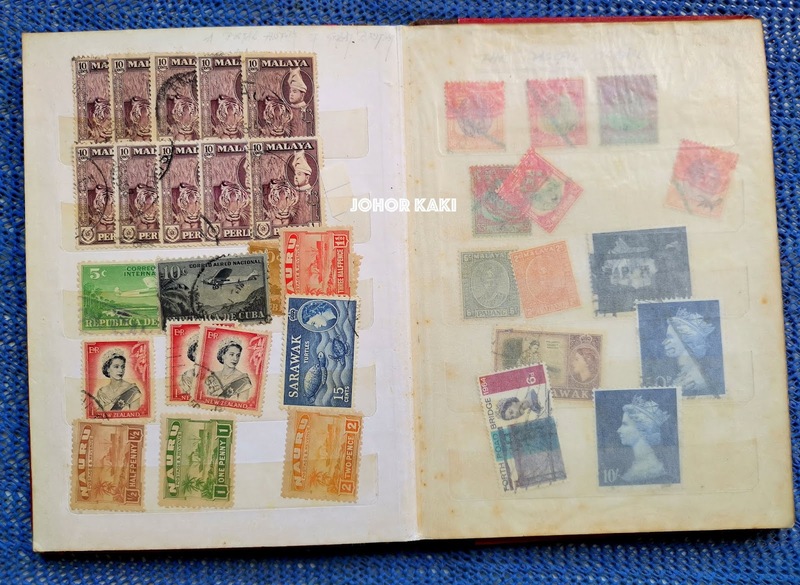 You see, as a child, I was an avid stamp collector. I couldn't remember how we met but I became friends with Mr. Snodgrass - I don't know his first name as I always addressed him respectfully as Mr. Snodgrass. I was in my early teens and he was either retired or a senior civil servant then - we shared a common passion for stamp collecting. On many an afternoon, I would take a rumbling one hour bus ride from Toa Payoh to Siglap where Mr. Snodgrass lived. It was a single storey house along Upper East Coast Road - I could not remember if it was sea facing but had memories of the sand, sea, waves and sea breezes whenever I visited him. We would sit in the garden facing dining room the entire afternoon and we would talk stamps endlessly over tea and cakes. We lost contact as I grew older and life took us elsewhere. Looking back, there was never any stamp of any significant value in my tiny collection. But, the real treasures were the priceless friendships, and the stories I learnt from those small pieces of coloured paper. Sometimes, I would wonder about Mr. Snodgrass. (And also old Mr. Teo, a retired civil servant who lived in Blk 157 Toa Payoh with whom I had a similar relationship.) I am grateful to Mr. Snodgrass and Mr. Teo for their friendship. This trail was created for the Singapore Heritage Festival 2019 in conjunction with the Singapore Bicentennial. It was conducted on 22 Mar and 24 Mar 2019. Used to pass by a single storey house at 141 (?) Upper East Coast Road (at the junction with Palm Drive) on my way to/from work daily, and remember seeing a nameplate with word "Snodgrass" displayed. The house is currently being demolished/rebuilt, so not too sure if it is still owned by the Snodgrass family. Thank you for the information. I will check on it. Appreciate much.